Figure A64. 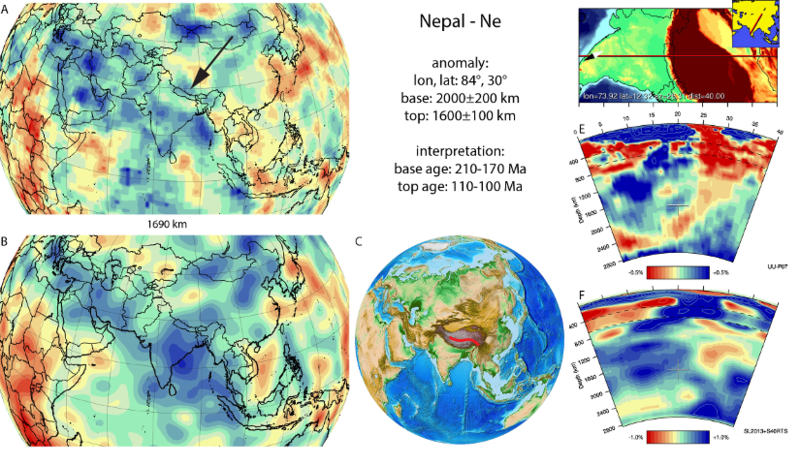 Nepal anomaly, interpreted as the Nepal slab, with (horizontal) [vertical] cross sections through (A)[D] the UUP07 p-wave) and (B)[D] the combined SL2013 and S40RTS s-wave models at 1690 km; C) the location of the modern geological record that we interpret to have formed during the subduction of the slab. is located in the lower mantle below the Himalaya. Its position south of the shallower part of the Mongol-Kazakh slab and north of the deeper part of the India slab suggests that the Nepal anomaly represents lithosphere that subducted during the mid-Mesozoic, and that its subduction record should be located between the Himalaya and Mongolia, i.e. in Tibety. The best candidate for its subduction location is the Bangong-Nujiang suture zone that formed in Early Cretaceous time upon collision of the Lhasa and Qiangtang terranes of the Tibetan Plateau. All other sutures in Tibet are Triassic or older in age (Yin and Harrison, 2000; Kapp et al., 2003; Zhu et al., 2013). Van der Voo et al. (2015) reconstructed the China blocks and Tibet relative to the mantle and portrayed the anomaly here identified as Nepal slab below the Bangong-Nujiang suture zone in the Early Cretaceous. Reasonable agreement exists on the age of closure of the Bangong-Nujiang suture zone. The suture zone contains radiolarian cherts that range in age from mid Jurassic to late Early Cretaceous (130-120 Ma), flysch deposits of late Early Cretaceous age, and unconformably covering upper Albian-Aptian (~110-100 Ma) shallow marine limestones (Baxter et al., 2010; Fan et al., 2015). Calc-alkaline and adakitic magmatic rocks of 115 and 110-100 Ma were interpreted to reflect slab roll-back and break-off, respectively (Chen et al., 2014; Wu et al., 2014; 2015). The age of the top of the Nepal slab can thus be dated at ~110-100 Ma. Arc magmatic rocks on southern Qiangtang have been reported of ~168 Ma (Liu et al., 2013) and 163 Ma (Li et al., 2014b), and northward subduction below Qiangtang since late Early Jurassic (~180-170 Ma) was concluded as a result (Xu et al., 2014). Based on a detrital zircon study, subduction below Qiangtang may have started as early as 210 Ma (Zeng et al., 2015), consistent with the paleomagnetically constrained onset of northward drift of the Lhasa terrane relative to Gondwana (Li et al., 2016). We use a 210-170 Ma age range for the base of the Nepal slab. An alternative model proposes that the Bangong-Nujiang Ocean did not subduct northwards, but southwards below the Lhasa terrane, and represented the main Paleozoic Tethyan Ocean. This model proposes that the Lhasa terrane was still connected to Gondwana in the Triassic and rifted away after the Bangong-Nujiang ocean started to subduct southward below the north Gondwana margin, opening the Neotethyan ocean as a back-arc from Triassic to Early Cretaceous time (Zhu et al., 2011; 2013). This scenario implies that the slab below the Lhasa terrane rolled back over a distance equivalent to the final dimension of the Neotethyan ocean, i.e. >7000 km. However, we find no anomalies in the lower mantle that span such an enormous width that would support such a scenario.